Helen and I love finding new iPad apps. When I first bought my iPad, the children (and I) were so excited we would spend whole sessions using it! However, I now see it as another tool in my ‘speech bag’. 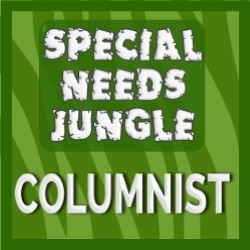 It is often offered as a reward – well the child sees it as a reward, I am still working on their targets! Or I have a specific app in mind that works on something I don’t have paper resources for. You can read a post I wrote about the challenges of using the iPad in therapy here. 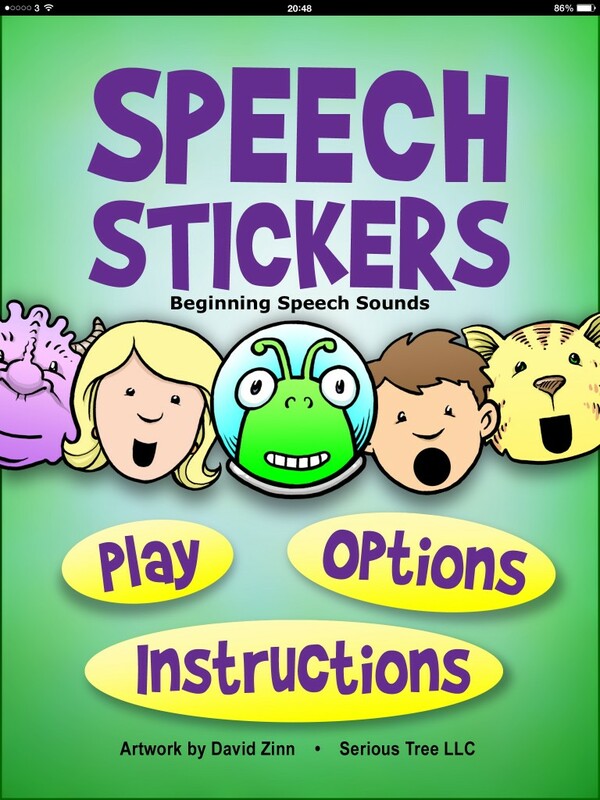 So today I thought I would write about one of my favourite articulation apps – Speech Stickers – Beginning Speech Sounds. It was one of the first apps I bought and I still use it every week! I haven’t been paid for this review or asked to write it; I just want to share the things I find useful. 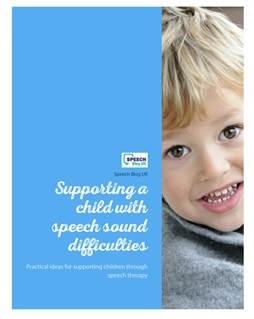 This app was designed by a speech and language therapist and has some lovely ideas in! When you open the app, it goes straight to the game screen. Now you have a control bar at the top, which you can have in either orientation depending on if you are sitting next to or opposite the child – great idea! 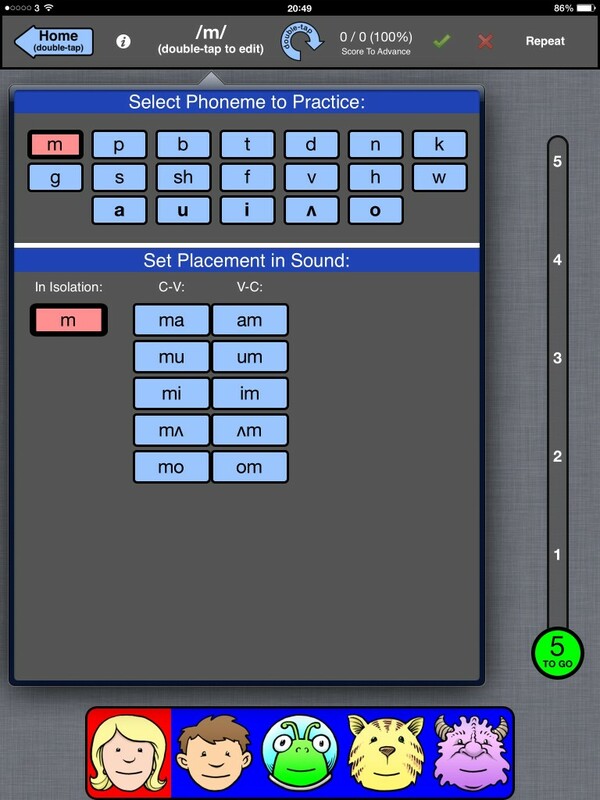 It is from here that you select the sound you want to work on, repeat the target sound and can record if the child’s production was correct or incorrect (which I will come back to). 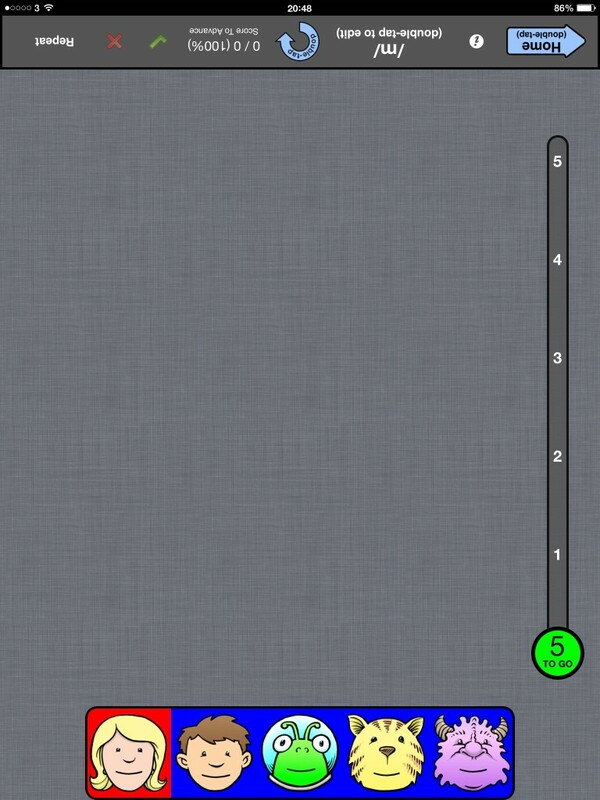 So the first job is to select the target sounds. 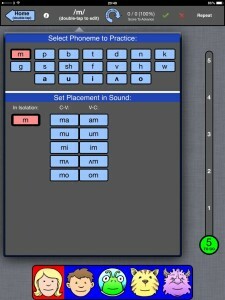 You can select consonants in isolation, consonant-vowel or vowel-consonant. It doesn’t have all consonants and vowels in-just the early ones, but to be fair if you are working on sounds in isolation and CV/ VC blending that’s OK! The game makes the target sound/ sounds and you encourage the child to copy. Now I often use a CV/ VC structure even if the child can’t do it yet and use it to practise blending! (Like Nuffield for the UK SLT’s). 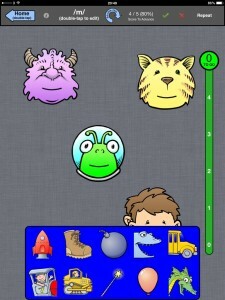 Then when the child has made the target sound or had a good attempt they can pick a sticker to put on the screen. 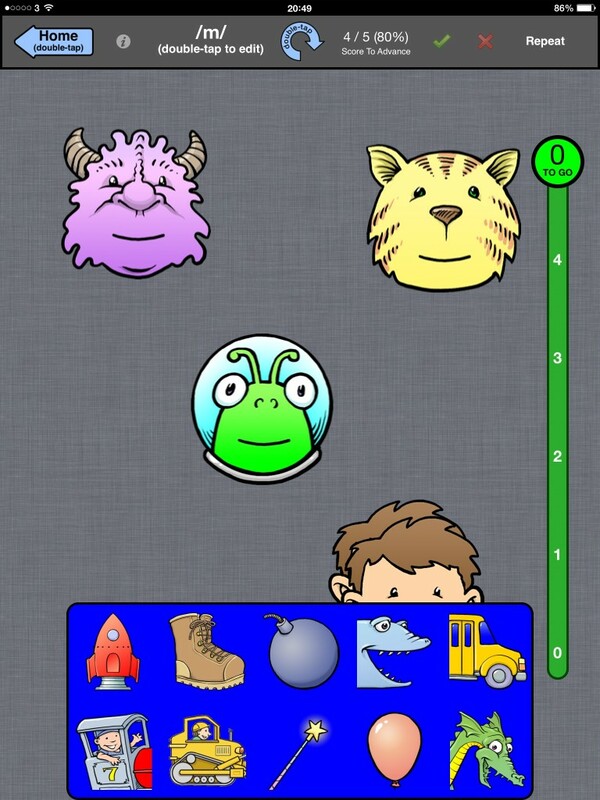 There are 5 ‘stickers’ – a girl, a boy, an alien, a cat and a monster. Each character says the target sound again and has their own voice. I love the monster who has a very deep voice! Each character also uses a different intonation pattern, which is great to try and get the child to copy. You keep going like this until the bar at the side is full (5 turns) and then the child gets a reward – they get to choose what happens to the stickers! Is a friendly shark going to chase them away, are they going for a ride on a train, or are they going to be squashed by a giant boot – lots of children think that one’s really funny! Then the game starts over. Nice and quick. As I said, there are some lovely touches to the game. In the bar, you have a cross and a tick to ‘mark’ the child’s production. This then gives you a percentage correct at the end (although with only 5 responses you can work it out quite easily!). I must admit I often give the child a tick even if their response is wrong as they quickly notice if you press the red cross! Now this is another lovely idea in this app – the child can’t have another go in the game until you have touched the tick or cross. So they can keep trying to put another sticker down but it won’t work until they have done some more good talking. This app is currently £10.49/ $18.99 – which I think is a great price. It may not have every phoneme in every combination, but that is reflected in the price. 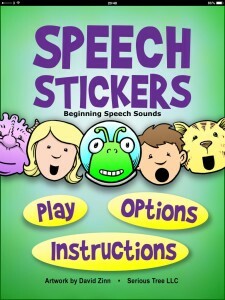 I find this app great for younger children just starting out with phonology therapy.